Spice up your Cinco de Mayo or any night with this spicy cucumber mint margarita. Fresh cucumber, jalapeno, muddled mint, and lime come together in this sugar-free cocktail. With Cinco de Mayo around the corner, I thought I'd hook you up with a fun and easy Mexican spiced cocktail. Living in LA, we love our Mexican food and beverage. It doesn't have to be any special day of the week for us to enjoy some great Mexican flavors. This spicy cucumber mint margarita is a sugar-free cocktail to bring some added color and taste to any celebration. So in addition to giving you a great cocktail, I'm also going to give you some other ideas so you can make your own Mexican fiesta from starters to salad and mains - all gluten free, dairy free, and free from refined sugar. Guacamole is an easy and delicious starter, but we've all been there, done that, so how about throwing in some black beans and added spice for something new and different. (Click the picture or title to go directly to the recipe). Three bean salads are a quick and fast side that get a more interesting nod with some Mexican spices like cumin, cilantro and lime. Tacos are a no-brainer for Cinco de Mayo or a Mexican feast, so make a spicy, dairy free cabbage slaw to layer on, or wrap in a collard green for a healthy burrito. 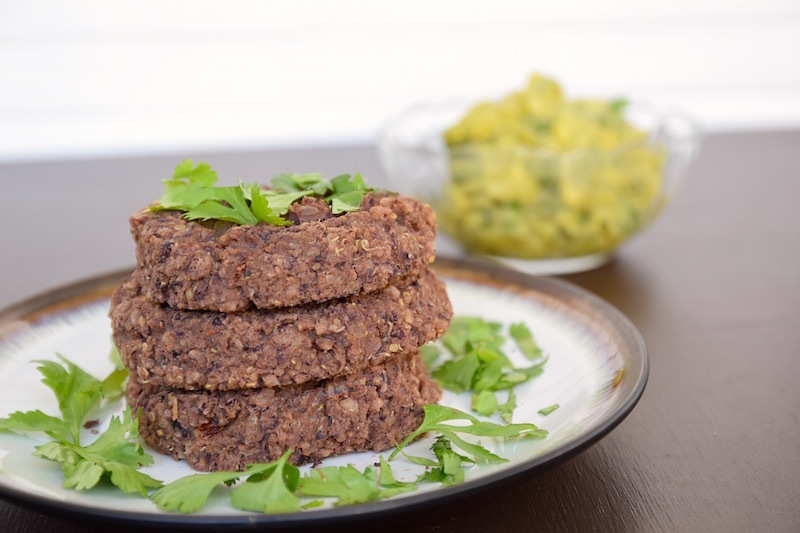 Better yet, mash black beans with quinoa to create a burger, topped with guacamole. Mangos bring a fresh taste to this Mango-rita or keep with the spicy jalapeno theme to give a twist to a Moscow Mule. Or try my new spicy cucumber mint margarita and have a great Cinco de Mayo! Cut the lime into 4 wedges and place in the bottom of a cocktail shaker with the mint leaves. Muddle the lime and mint together until fragrant. To create the cucumber and jalapeno juice, use a juicer. You can also use a blender and then strain the pulp. One other option is to muddle jalapeno slices with the mint and lime. Add ice and the remaining ingredients and shake until combined and cold. If you'd like a salted rim, line a small plate with chili spice and salt. Wet the rims of your glasses and run the rim around the salted plate.